Bright colors accent zebra prints. Zebra and pink cakes for a wedding offer a bit of wild fun for any reception! This dessert choice conveys the message to your guests it's tie to let loose and join the party! 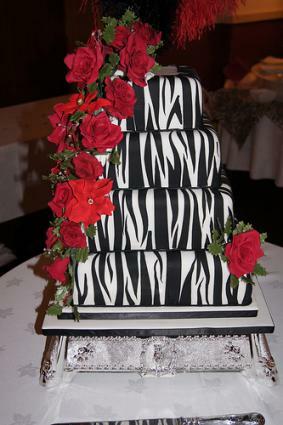 The most popular choice for the crazy color scheme is to go all out and decorate the outside of your cake in a zebra print. If you choose to do that, the frosting is going to be the star of the show, so you'll have to decide whether you want flavor or appearance to trump all. If it's flavor, go with buttercream, which most people agree tastes far better than fondant and has a much more appealing texture. If you want your cake to look as smooth, polished, and professional as possible, though, ask your decorator to use fondant. It's overly sweet and has a somewhat gummy or chalky texture, but since it's basically a baker's modeling clay, it has the potential to turn out some of the best-looking designs possible. Even if you know you want a zebra print on your cake, you still have some decisions to make about how you want it to appear. Do you want a three tier round cake with black and white on just one tier? A single layer sheet cake with allover zebra print? Look through a wedding cake gallery or do a web search before you meet with potential decorators so that you'll be able to communicate what you want most from the design. Maybe you love the idea of a zebra cake, but your soon-to-be spouse just can't handle it, or you're both intrigued by the idea but aren't quite sure you want to go through with it. There's one way to compromise: putting the zebra print on the inside of the cake instead of on the outside. 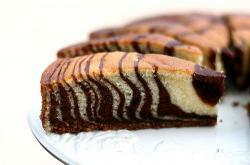 Really, a zebra cake is just a marble cake made with a little more care, so it has the added benefit of including both chocolate and vanilla flavors in a single piece. That means you can choose a frosting, curd, or filling that goes with either flavor, and the inside of your cake will be far more striking (and hopefully tastier) than most. Zebra print wedding cakes really pop when combined with pink. Make this design your wedding cake, and this wedding dessert will take center stage at the reception.